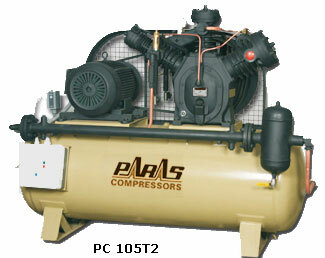 Paras Compressors are user friendly and they are efficient due to staging besides they also produce more Air pressure which is required for many other applications. Paras reciprocating compressors also very useful and reliable for compressing and pumping liquids it also most prominently used in oil refineries, chemical plants, pipelines and natural gas processing plants. Multistage heavy duty Air Compressors are designed for high pressure operation up to 70.31 kg / cm2g (1000 psig). These compressors are used in Valve and System Testing, PET Bottling Industries, Diesel Engine Starting, Laboratory Test Work, Space and Aviation Industries, Air Blast Circuit Breaking, Dairy, Marine and Military Applications etc.